The steamiest Civil War reenactment ever. 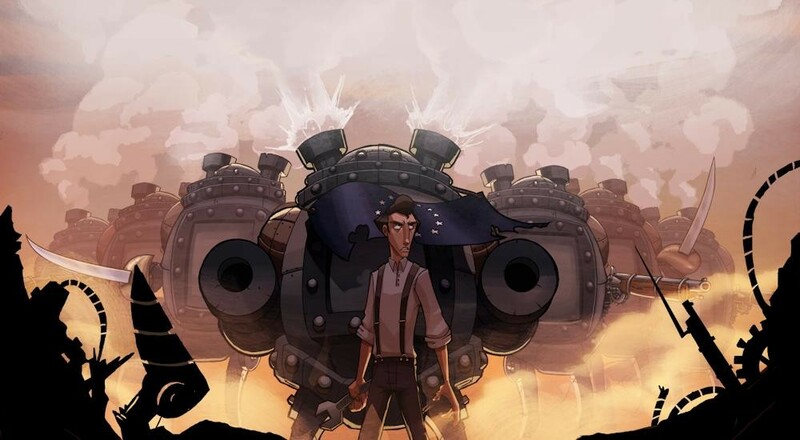 Ironclad Tactics comes from Zachtronics, the developer of the intensely cerebral SpaceChem. That fact might send a little shiver of fear across your cortex, but don't fret. Ironclad Tactics is easy to get into but still manages to provide a very deep experience once you spend some time with it. The story unfolds as you journey across an alternate version of the continental U.S. during its Civil War. The big difference, as many historians will note, is there are steam-driven machines used in combat, not just dudes with Hulihee beards. The basic goal is to march your coin-carrying machines across the field, scoring a point for each coin and winning once you reach eight. Your opponent is trying to do the same, meaning you have to deploy units to battle theirs or risk staring at the wrong end of a game over screen. 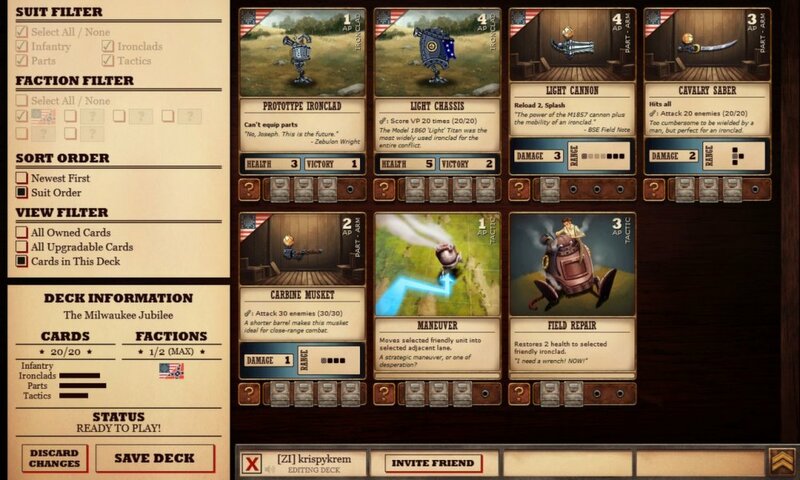 Ironclad Tactics is all about the cards. The action takes place on a 9x4 grid with your units starting on the left and your opponents' on the right. Your deck unfolds one card at a time with a maximum of five cards in your hand. By spending action points (AP) you can place these cards on the field, summoning ironclads, calling in the infantry, equipping weapons and hats on certain machines, or initiating instantaneous tactical events. Each turn the units do their thing, stepping forward, firing their weapons, and if they're ironclads, squishing infantrymen like they're water balloons. The whole thing has the ambiance of a collectible card game with the tension of a turn-based strategy game, all rolling out at a sometimes frightening speed. 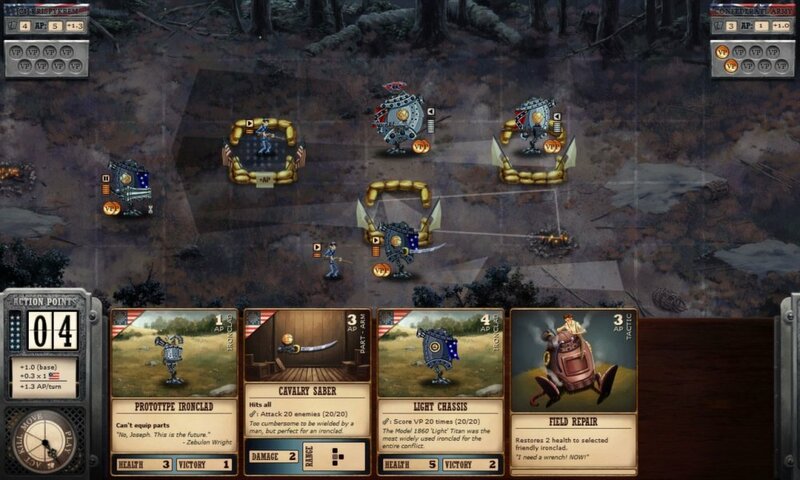 Ironclad Tactics is technically turn-based, but those turns are on a strict timer. You'll have a few moments to make your decisions and talk to your teammate, but it's not like you can go make a sandwich while pondering who should get the upgraded musket. Each round begins with the play phase, allowing you to pull cards out and use them on your units. After a few moments the action phase begins, setting in motion everything you just put out. Units then attack each other, followed by the destruction of any zero-health infantry or 'bots. Finally the move phase steps everyone forward and awards you with additional AP before it starts all over again. Managing cards quickly becomes a vital part of the game. There are around 80 in all, each unlocked by completing story missions, winning while satisfying certain crazy conditions (protect the Jefferson statue? You have GOT to be kidding me! ), or by completing the puzzle and skirmish rounds for each city. You're limited to 20 cards per deck, with a maximum of four of each card type per deck. Cards are divided into factions as well, and you can only have two factions per deck. One deck won't cut it for every stage, you'll need to have a few saved and ready for customization before each level begins. Be prepared to spend half as much time tinkering with cards as you will staring at machines on the battlefield.